At a glance the Field Spaniel is an independent breed however pleasantly mixed with sincere devotion, a sensitive nature and a willingness to please. A family dog in every sense of the word they thrive at constant companionship and affection. The Field Spaniel is known for its docile nature and may be commonly reserved with strangers at first meetings and warm up on their own accord. This reserved tendency should never be confused with shyness, however. The breed simply just tends to be cautious at times. As a workman the breed has evolved into one that is fit for the show ring and the home in one medium sized package. There is no divergence among working dogs and bench (show) bred dogs and it is the Field Spaniel Society of Americas mission for the breed to remain as such. The Field Spaniel is a solidly built dog yet displaying a vision of nobility and high breeding, never overdone or extreme, truly a case of beauty and utility combined. Once on the brink of extinction due to breeding fads of the era, The Field Spaniel Society of America and its members strive to promote the breed as the breed was intended yet maintain from and function. A sporting spaniel able to keenly work a day in the field yet a loyal companion in the home and a dog structurally sound in overall confirmation. 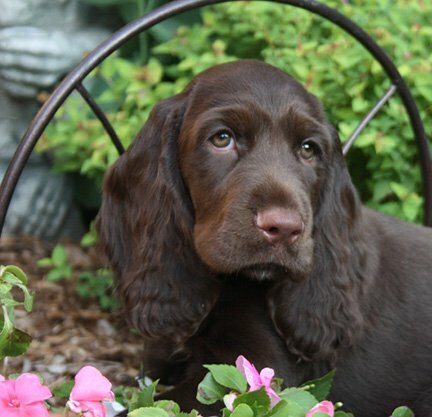 The Field Spaniel Society of America welcomes your interest in the breed. Within this site you will find links to breeders and enthusiast nationwide we would also like to encourage you to explore the site for more detailed information regarding the breed.. The primary purpose of the Field Spaniel Society of America is to encourage and promote quality in the breeding of purebred Field Spaniels. Our club offers Field Spaniel owners throughout the U.S.A. the opportunity to work together in the best interest of the breed. Club members receive a quarterly newsletter, breeder referral service, educational opportunities and a voice in shaping the future development of our club and our breed. All Field Spaniel owners and fanciers are encouraged to join FSSA.